Held by Zeelandia UK, the students were treated to a full day workshop - starting with theoretical background before delving straight into applying the newly acquired knowledge through practical application, test baking and analysing the results. The day also featured a bakery master class, run by Technical & Development specialist Andrew Taylor – himself a former National Bakery School student. Andrew returned to the School to discuss the wide range of careers available within the bakery and wider food industry, ahead of next week's National Careers week. Zeelandia UK, part of the Dutch family-owned Zeelandia Group, has been serving the professional bread and confectionery trade worldwide with high-quality baking ingredients since it was founded in 1900. "The workshop was both informative and inspiring," says Elaine Thomson, Course Director at the National Bakery School at LSBU. "It was a great way to learn about the science behind bread with theoretical and practical 'hands on' application. 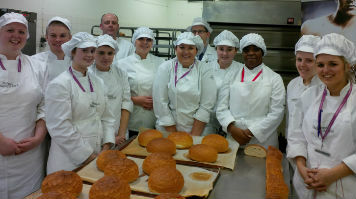 The National Bakery School hopes this event can be repeated for future cohorts." The National Bakery School at LSBU is celebrating its 120th birthday this year. The NBS is the oldest bakery school in the world, and has been renowned for its unique ceremonial baked goods ever since it opened in 1894.
Notable creations have included Prince Charles' christening cake - and in 2004 bakery students worked with designer Jean Paul Gaultier to recreate some of his iconic designs in bread. Find out more about the National Bakery School.